This extraordinary collection of prints about the French Revolution was acquired by Baron Ferdinand de Rothschild (1839-1898) in the 1890s. Bound into four large volumes, the prints record major events (such as the storming of the Bastille and the executions of Louis XVI and Marie-Antoinette), but also some of the more obscure episodes of the Revolutionary decade, often with a highly satirical, political eye. The images are available online as part of the Waddesdon Manor online collection catalogue. The albums contain nearly 500 prints depicting the unfolding of the Revolution, from the events leading to the storming of the Bastille in July 1789 to the execution of King Louis XVI in January 1793 and beyond, through the Terror to the advent of Napoleon in 1799. A few date to after 1815. Political turbulence from 1788-9 led to the relaxation of censorship laws, to which printmakers responded with a surge in production. Prints reported events, provided images of key personalities and sought to reflect and to influence public opinion. The Waddesdon albums encompass crude images produced quickly to keep up with the rapidly changing times; sophisticated propaganda; and more finished works of retrospective contemplation. About half of the works in the Tableaux de la Révolution were made by anonymous artists or printmakers. Perhaps the often incendiary nature of the subject matter encouraged them to hide their identity. However, the fact that just under half have named engravers and around a third have named designers indicates that this was not always the case. Prior to 1789, printmaking had not been given a prestigious status by the Académie royale de peinture et de sculpture, but the Revolution gave printmakers an extraordinary opportunity to profit from the public appetite for images of current events. Many were made as quick etchings, while others were carefully crafted using complex, combined techniques: some images even exploited the latest colour printing technology. However, the majority of coloured prints in the Waddesdon Collection were painted by hand after printing, some possibly later in the 19th century, when a lively market for Revolutionary prints developed. In the 1890s, the 18th-century prints were bound into albums using red leather boards with gold tooling taken from eighteenth-century books, probably by Ferdinand de Rothschild’s Parisian book dealer, Damascène Morgand (active 1875-1912). Ferdinand acquired some of the prints from the French architect and collector Gabriel-Hippolyte Destailleur (1822–1893), who designed Waddesdon Manor. Ferdinand de Rothschild was fascinated by the Revolution. Critical of the Old Regime, he wrote that ‘the Revolution apparently brought to the people of France the realization of their most ardent dreams and desires.’ Despite this sentiment, he filled Waddesdon with opulent French art from the Ancien Régime. As an historian he was also attracted to works of art that gave access to the lived experience of the past and it is characteristic of his collecting that these albums include numerous examples of printed ephemera, from examples of Revolutionary currency to army recruitment documents and membership cards for political clubs including the Jacobins of Paris. Ferdinand’s collections also encompass many perspectives on the events of the Revolution. Although many of the prints are pro-Revolutionary in general terms, Ferdinand took particular care to ensure that critical views were also present, and a good number of the prints are overtly counter-revolutionary. Some were printed for propaganda purposes outside France. Between 2008 and 2011, the prints were catalogued as part of a Collaborative Doctoral Research project organised by Queen Mary University of London, University of Warwick and Waddesdon Manor (Pippa Shirley/ Juliet Carey/ Colette Warbrick), and funded by the Arts and Humanities Research Council. The doctoral students responsible for the cataloguing were Paul Davidson (QMUL: Supervisor Professor Colin Jones) and Claire Trévien (Warwick: Supervisor Dr Katherine Astbury). Supervision and editing of the cataloguing work was the responsibility of Dr Phillippa Plock, Dr Astbury and Professor Jones. All texts were translated and 54 prints have in-depth commentaries explaining their political, social and historical contexts. The project also included an exhibition: A Subversive Art: Prints of the French Revolution, Waddesdon Manor, 2011 season, co-curated with Dr Juliet Carey. Search the Tableaux de la Révolution database to see the huge variety of satirical images depicting all aspects of the French Revolution. Each of the two doctoral students who catalogued the collection of prints chose a group to explore further in relation to their theses. My doctoral thesis outlines how the representation of Paris changed over the course of the first half of the Revolutionary decade, looking at the city’s depiction through the medium of popular prints which directly addressed the current events of the period. In the course of my study, I investigated how printmakers captured the physical changes to the city, as well as other developments in the boundaries of public, private, symbolic and liminal space, in areas such as political rhetoric. A particular concern was to explore the role of the Parisian artist as printmaker in relation to the city and to consider to what extent this relationship changed over the course of the Revolution. Cataloguing the Tableaux de la Révolution gave me the opportunity to focus my research on the object (the print) itself, applying an analysis to each individual print’s subject, chronology, theme and symbolism. A number of prints held in the Waddesdon collection have been of direct inspiration in my research by presenting major and minor events which incorporated visual recordings of the urban topography amongst the political and social narratives apparent in the prints. While many scenes of major events such as the storming of the Bastille (acc. no. 4222.9.8) worked to mark a popularly accepted historic moment, others showed changes taking place in the physical makeup of the city as well as in the varying ideological and symbolic factors that the transformation of particular spaces provided (e.g. acc. nos 4222.13.16; 4222.14.17; 4232.1.83.170). Monumental structures which were seen to be of importance in the whirlwind of Revolutionary politics were also prime subjects for printmakers, such as the church of Saint-Jacques de la Boucherie during the nationalisation of church property, and the Temple fortress during the incarceration of the royal family. Like the Bastille, these buildings no longer, or only partially, exist. Though perhaps not entirely accurate, such images offer the printmaker’s unique perception of both the buildings (acc. nos 4232.1.84.171; 4232.2.31.50; 4232.2.31.51). While there was a proliferation of prints depicting major events, Revolutionary printmakers also focused on more intimate scenes in which various elements of day-to-day Parisian life appear. Such genre prints, mainly etchings, include political reaction at the Palais-Royal (e.g. acc. no. 4232.1.19.40); satirical images evidencing the filthy nature of the city such as its open sewers (e.g. acc. no. 4232.1.80.164); some eccentric bathing practices (e.g. acc. no. 4222.35.44); means of public transport for crossing the Seine (e.g. acc. no. 4232.1.43.85); and other street scenes showing demonstrations and expressions of public opinion, as well as the relationship between private and public spaces (e.g. acc. no. 4232.1.43.86). The topography of the city, in both its physical and demographic layout, was of direct relevance to the makeup of the Parisian crowd which filled its streets, and the crowd’s mobility within and beyond the limits of the city. The march of the October Days is one example of this (acc. nos. 4232.1.69.143; 4232.2.24.38). The march was a reaction to the lack of grain and to alleged reports that the National Cockade had been trampled underfoot by soldiers at a lavish banquet held in the Opera at Versailles (acc. no. 4222.10.11). 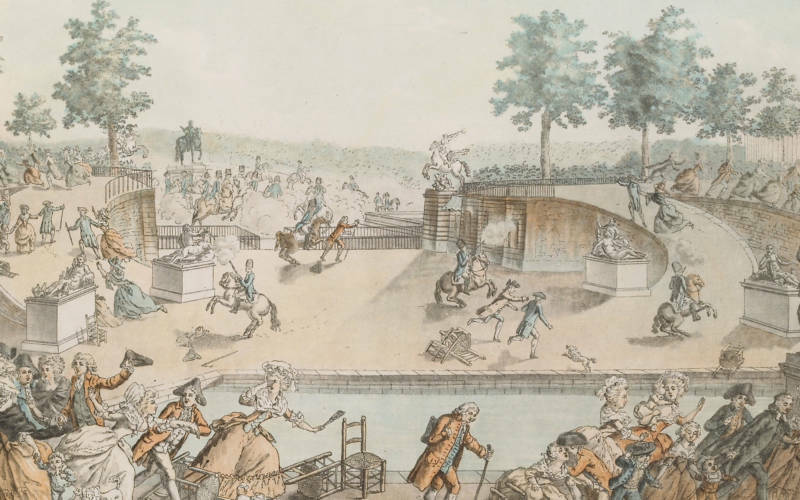 The mobility of the crowd changes in prints where the urban topography allows for viewing and spectacle, namely in the Places Louis XV (later the Place de la Révolution, and today the Place de la Concorde), and the Place de Grève. Such sites were the location for public executions, many of which were depicted in prints (accs. nos 4232.1.57.113; 4232.2.35.61; 4232.2.47.80) The crowd in these scenes generally appears as an ordered, singular mass. The space complements the event, allowing an open forum for the public to watch the individual who was being executed, generally in the centre of the image. Printmakers also took the opportunity to depict popular individuals who played a role in Revolutionary activity. Such figures may have been heroes like Humbert and Arné (acc. no. 4232.1.48.96); characters of legend and myth like the prisoners of the Bastille (acc. nos 4232.1.52.104; 4232.1.54.107); or subjects of mockery and satire, such as the royal family and politicians (acc. nos 4222.61.61; 4232.1.13.27; 4232.1.70.144). The variety of prints depicting specific individuals by different means such as portraiture, satire, zoomorphism and allegory highlight the creativity and differing talents of Revolutionary printmakers, as well as reflecting the political divisions which certain characters helped to define. This PhD investigates the notion of spectacle and theatricality within the visual culture of the French Revolution, specifically prints. The aim of the thesis is not to reduce prints to simple historical witnesses or illustrations conveniently presented to suit an argument. Instead, it is a study of some of the metaphors evident in the prints, an approach that highlights the links between theatre, politics and visual culture during the French Revolution. My first chapter deals with the notion of performability in prints, in particular the relationships between song lyrics and images, and how the spectator could engage with the print. The second chapter explores the role of the carnivalesque in the construction of the Fête de la Fédération of 1790, as well as in prints employing Commedia dell’Arte characters to comment on politics. It demonstrates similarities between the role of the carnivalesque in actual Revolutionary events as well as its importance for the imaginary space. The third chapter investigates the spectacle of science and the connection Revolutionary politics had with new inventions. The prints discussed here demonstrate a preoccupation with the idea of illusion, not just as a negative act of deception, but as a creative and potentially empowering process, allowing the viewer to see beyond reality into a brighter future. Finally, the fourth and last chapter uses theories of ‘hauntology’ to comment on Revolutionary prints and plays depicting deceased characters in heaven, hell, and haunting the living. A term often used in the title of these works, ‘ombre’, suggests that depictions of the afterlife were deeply entrenched in the interplay of light and darkness. I therefore explore how these depictions of an imaginary world are linked to the fashion for shadow plays as well as the technical advances that allowed for greater subtlety in shading the stage. The cataloguing of Waddesdon prints has been a crucial part of my thesis research, suggesting areas of interest as well as providing an opportunity to study a large number of prints systematically. Many of the French Revolution prints at Waddesdon have an indirect or direct relationship to spectacle and theatricality. Of the 25 prints on which I have written commentaries, three in particular show the performative nature of French Revolution prints (acc. nos 4232.2.41.71, 4232.2.4.3 and 4232.2.6.7). In one of these, modified lyrics set to a popular tune from Beaumarchais’ play Le Mariage de Figaro are used to comment on a contemporary event. The juxtaposition of music with a dramatic image make this a ‘performable’ print. The other two deliberately employ the language of street theatre and dance in order to comment on contemporary politics. 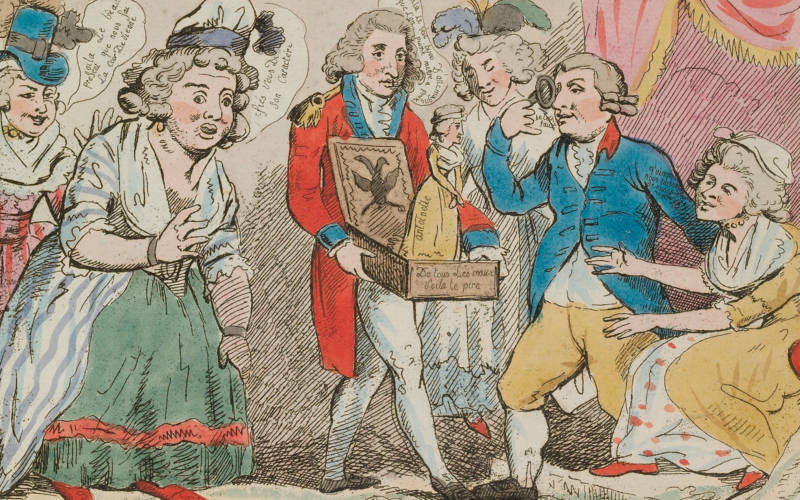 The influence of popular entertainment is also apparent in two other prints (acc. nos 4232.2.4.2 and 4232.2.6.8) where imagery of public tooth-pulling and turkey dancing are used to comment on the political situation at home and abroad. Spectacle occurs outside of the realm of the stage too, with one particular print demonstrating the power of the magic lantern (acc. no. 4232.2.33.57). Imagery of disguise, and the need to reveal characters’ true natures, appear throughout the collection. The human body becomes the stage on which a variety of issues, social and political, can be represented (acc. no. 4232.2.5.6). A print of Chabot as a Janus-like figure split between his past and present appearance, serves to call into question his true character (acc. no. 4232.2.16.26). In another print, a mistrusted army general is given the guise of Harlequin (acc. no. 4232.2.57.101). The Royal family’s flight to Varennes led to numerous prints mocking the style of their escape, but in Hairstyle for Crown (acc. no. 4232.2.17.28), it is the commonness of their chosen disguises that provokes laughter. Tension is apparent throughout the collection between popular and vernacular representations, and more erudite depictions that draw on classical references (such as acc. no.4232.2.76.171 and 4232.2.58.102). In a print of Jean Sylvain Bailly (acc. no. 4232.1.66.134), for instance, the printmakers mock the erudite nature of his past profession – as an astronomer – by showing it to be incompatible with common sense. Others try to make use of the popular to win themselves more supporters, as is the case with one counter-Revolutionary print (acc. no. 4232.2.58.102) where cultured references mix with scatological jokes. A large number of the prints are concerned with death whether depicting executions or remembering martyrs (as is the case with acc. no. 4232.2.30.48). More imaginative takes on these portrayals exist, such as the personification of Republican virtues in a format that follows one often chosen for martyrs (acc. no. 4232.2.32.53). Death is portrayed theatrically, even melodramatically, in some of the prints (acc. nos 4232.2.30.49, 4232.3.21.33, 4232.3.21.34 and 4232.3.23.38). However, in others, a clever use of hidden facial profiles lends the prints a haunting quality (acc. nos 4232.2.32.54, 4232.2.33.55, and 4232.2.35.50). 4232.3.2.1; Unknown; Print or Fan Design Titled ‘XVI Equals XII plus IV’; Paris; 1790?